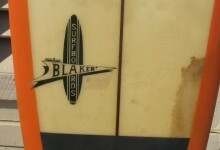 Blaker surfboards was started by McDonald “Mack” Blaker in 1963 in Houston, Texas. Shapers at Blaker included Surfers Journal founder Steve Pezman and Stu Herz. 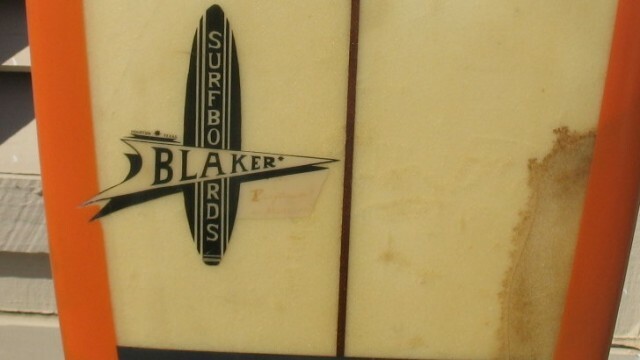 Blaker surfboards closed their doors in 1970. Nice board. Mac Blaker is my uncle. Always looking for Blaker boards. Can I ask where you found this one. A co worker just gave me a surf board that was in the rafters of a barn on some land he purchased. It’s a Blaker board that is in pretty rough shape. Just got it last night and have not had time to dust it off and clean. Really stoked about this board. Its owned by a collector on the East Coast. He has an awesome collection of boards. I can email you their contact info if you would like. I work for Rockport auctions and we have a blaker vintage board coming up in our auction on 12/07/13 this sat. Do you know what it might be worth? I could send pic. Condition is always key when looking at value. I had a Blaker, alilator surf board, by max blaker, probably 67-68. cost me 300 bucks, brand new custom made with wood runners. 9 foot 2 inches. wish i still had it. I am 63 now.